There are multiple electrical appliances in most of the homes these days besides the normal wiring and switches, doorbells and a lot more. Even if one of them seems to give trouble it gets a daunting task to find an electrician who is a professional and has enough experience to assist us in these electrical problems. Apart from the domestic works, there are also commercial and industrial electrical repairs like earthing, creating cable connection, making circuit and locating them, conceal and double wiring, for which you need a trained and certified electrician. Electric repairs are not as easy as they seem. 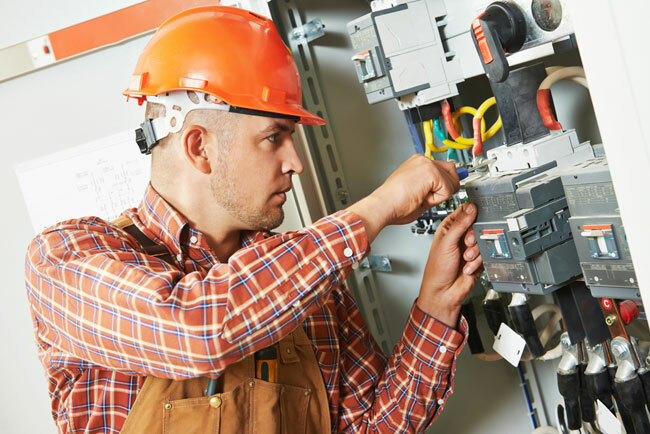 Subtle electrical repairs like preparing the high voltage circuit, locating the power supply from an internal and external source, and understanding the delicate concealed lines are some of the most complicated things that require major attention from experienced electricians. Once an electrical repair is done haphazardly there is definitely going to be issues with safety as these can lead to fires, shocks and many other types of accidents. This can be avoided once you have made up your mind to seek professional help. Minor and major electrical repairs and external and indoor repairs work require different skilled electricians to work on them. So you can search from the local classifieds, the newspapers and the internet to find out more about trained and local electricians. You require a certain type of education in dealing with electricity and the appliances connected to this. There is no way you can learn this trade by just watching someone fix a fuse or correct the wiring.You need to make sure of the electrician’s license, degree and also insurance. Electrical repairs done on your own might work out a costly affair in the long run if not attended to properly. You might have to spend initially, but can be assured that you are saving money in the long run by handing over the repair work to a professional. A minor problem might make you feel you will be able to handle it, but a professional electrician has the right knowledge of where the problem lies and find out troubleshooting the right manner. Circuits which have been worn off or poorly designed are able to cause major damage to home appliances and electronic gears as they tend to deliver the wrong amperage or, those circuits which suffer from voltage fluctuation, can even cause fire hazards. Wiring only seems a simple process, but is a complex one with a lot of interdependency. Thus, if you are not well informed on this it is easy to get into other circuits which were not even considered initially. This might be confusing and cause more harm than required. Seeking professional help for any electrical repairs you are given some sort of a guarantee. This can assure you being relaxed and not having to spend on minor problems off and on. It is a must that journeymen or masters dealing with electricity need to be certified by the state, besides need to pass certain requisites which is a big step in ensuring that you have been able to hire the right professional who can offer quality work. In large industrials projects and also for domestic purposes, there are project sanction plans for electrical repairs, and you can consult the building development authority or the electrical companies to compare the rates and ranges of their service regarding electrical repairs. If you carefully consider all the above mentioned points you will definitely able to find best electrician for electrical repairs. Benefits and Considerations for Double Hung Windows!